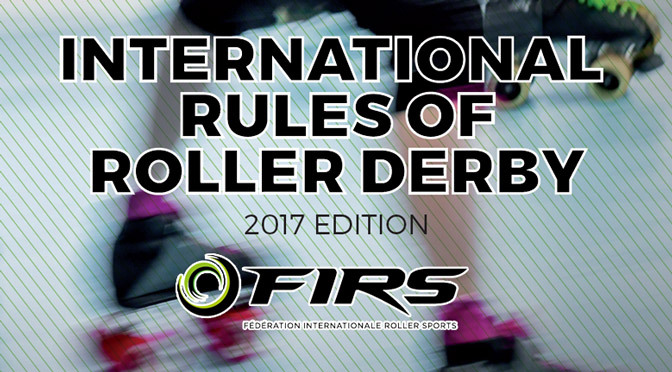 The Fédération Internationale de Roller Sports (FIRS), recognized by the International Olympic Committee as the official international governing body for all things roller sports, has released the first version of its rules of roller derby. They officially go into effect on January 1, 2017. The move comes ahead of the ramp-up to the organization’s first combined world championships, the World Roller Games, taking place this September in Nanjing, China. Along with those of inline speed, rink hockey, artistic skating, and many other skating disciplines, the Roller Games will feature the first recognized world championship of roller derby—played under FIRS roller derby rules. “The first edition of the International Rules of Roller Derby will be used in all official competitions under the Olympic Movement, including the rules for the 2017 World Roller Games and future events in which the sport gets accepted as a discipline,” said FIRS in a press release. The publication of FIRS rules confirms one of the worst-kept secrets in roller derby. The FIRS Roller Derby Technical Committee Chairman, Fernando Regueiro, was previously the chair of the USARS Roller Derby Sport Committee where he was a key part of developing USARS Roller Derby rules. Upon being promoted to FIRS, he took the USARS rule book along with him. As a result, the 2017 FIRS Roller Derby rule book is effectively an updated revision of the 2015 USARS Roller Derby rule book. Click the image to read the FIRS Roller Derby 2017 Rules PDF. This means that FIRS roller derby, like USARS roller derby, will feature fast gameplay in the derby-only direction, pivot breaks that encourage tight competition during all scoring passes, dynamic lead jammer status, and other rules that help ensure that simultaneous offensive and defensive engagement happens during all moments of a jam. The new rules come despite the sport already having an established international rule set (and governing body), that of the WFTDA. However, FIRS has specific intentions with its version of the game, going places the WFTDA is currently not willing or able to go. As things stand now, any and all international roller derby competitions within the Olympic Movement must be sanctioned by FIRS, since FIRS is the only governing body currently recognized by the IOC to organize these competitions. The Roller Games are one such event, as are various Continental and World Games. With FIRS being an international governing body, it is only focusing on international competitions not currently featuring roller derby. After the fallout of the WFTDA “slow derby” era, which drove away many fans,1Some might argue that the “slow derby” era is still ongoing. FIRS feels that its different rule set may be just what the sport needs to reach out to new audiences through these high-exposure competitions. After the rules were published, Regueiro took to Facebook to comment on the position of FIRS and address some of the community’s concerns. “This is also after both rules were shown side by side to the leadership of FIRS and to the Organizing Committee of the Roller Games, who all decided to adopt the style where players would continuously move forward and skate fast. Regueiro also alluded to the fears that FIRS would require national skating federations to adopt their roller derby rules over those of the WFTDA. This hands-off approach on the national level dovetails with the FIRS derby rule book itself. 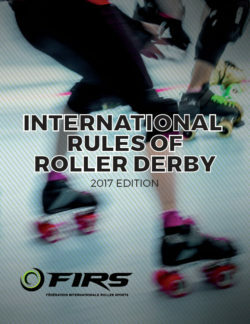 The very first page says that “National Federations have discretion to decide the date of implementation at national level.” Existing countries with ties to FIRS and that have established roller derby programs under the WFTDA banner are free to adopt FIRS rules any time or create national teams to enter in competitions that use them, but nothing compels them to do so. Basically, FIRS will only be enforcing use of its rules at the international competitions it sanctions. However, this is still something of a problem for FIRS, given that it currently has next to no teams or officials experienced in their usage. That’s an even bigger problem now that the Roller Games are only nine months away. Whether this plan will be enough for FIRS to assemble a credible turnout of men’s and women’s roller derby teams in China this September for the World Roller Games is still not clear, but at least we now have some idea of just what that plan looks like. More pertinent for us, we now know what FIRS rules look like. As we do with every ruleset of significance, Roller Derby Notes will put FIRS roller derby rules under the microscope with a full analysis. Look for that next month, and stay with us all year as we keep a critical eye on the FIRS roller derby program.